LONDON, 2017-Sep-06 — /Travel PR News/ — The first tranche of British Airways’ £400 million investment in Club World, its long-haul business cabin, is set to arrive on September 1 as a new restaurant-style dining experience launches on flights between Heathrow and New York JFK. Travellers will be able to select their choice of freshly prepared starters and desserts from new display trolleys, which will be served by the crew on to new table settings. 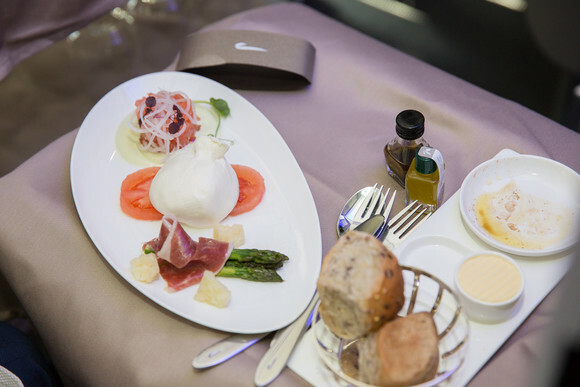 Colin Talbot, British Airways’ head of catering, said: “We’ve really focused on attention to detail with the new Club World menu, with the aim of delivering a real restaurant experience in the sky. We’ve considered everything from flavours and textures, to look and feel, all of which have to work at altitude. The dishes are designed to pop with taste and the table settings are both elegant and practical, with thought-through details such as stemless wine glasses. From Autumn, the second phase of the investment will begin, when British Airways’ partnership with The White Company will deliver customers a great night’s sleep in the sky. The iconic British retailer will supply bedding including an elegant day cushion, a bespoke, luxuriously soft large pillow, a super-soft woven blanket with satin trim and a specially developed luxury duvet to improve their quality of sleep, as well as a padded mattress cover giving an extra layer of comfort. The White Company will also supply amenity kits in an elegantly designed bag, containing the retailer’s ‘Restore & Relax Spa Collection’, as well as a soft jersey eye-mask.The revamped Club World catering and sleep experience will be rolled out across the airline’s long-haul network throughout 2018. In addition to the £400 million being spent on Club World, at Heathrow a First Wing check-in area with direct security and lounge access has launched, and lounges around the airline’s network are to be refreshed and improved. The Club Europe cabin has also been introduced on UK domestic services and all customers can look forward to the latest generation Wi-Fi across British Airways’ long-haul and short-haul fleets over the next two years. This entry was posted in Airlines, Flights, Food & Drinks, Travel, Travel Services, Travelers and tagged British Airways, Club World, Colin Talbot, restaurant-style dining experience. Bookmark the permalink.